One of the most famous cards out of the Neo Genesis expansion came from a deck that could dump a ton of Water Energy into the discard pile and then cycle it all back into the deck to deal massive damage. As long as you could pull it off consistently, you could be dealing a ton of damage every turn, upwards of 120-130 each turn, which was well more than enough for most Pokemon at the time. And the centerpiece of it all was Feraligatr. Feraligatr is a Stage 2 Water Pokemon, 120 HP, with a Grass Weakness, no Resistance, and a Retreat Cost of 3. The main draw is his Riptide attack, upon which the deck is named after, which could shuffle back all the Water Energy in your discard pile and deal 10 damage on top of the initial 10 damage for every Water Energy that was in the discard pile before being shuffled back into the deck. 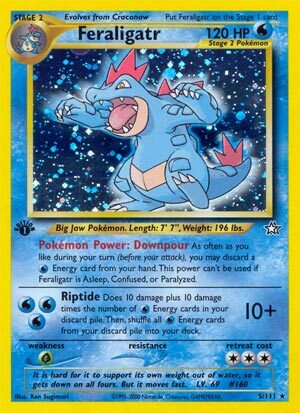 For 3 Energy, that seems like it wouldn’t be useful, but Feraligatr had a few tools to utilize, one of which being his Downpour Poke-Power which let the player put any Water Energy in their hand right into the discard pile, provided that Feraligatr wasn’t affected by a Special Condition. Other cards that would be run in the deck were primarily used to get Feraligatr out faster, stall the opponent as the player powers it up, and put a lot of Water Energy in the discard pile. Since this was before Supporters were really initiated into the game, cards like Professor Oak were great for dumping out hands filled with Water Energy for a fresh set of new cards and to load up the discard pile with Energy. Misty’s Wrath and Secret Mission were also used to cycle through the deck quickly and put all the Energy down as quickly as possible for a maximized Riptide, but one of the most important cards was Trash Exchange, a card that let you shuffle your discard pile back into your deck and then discard cards from the top based on how many were in your discard pile before. Pokemon Trader and Pokemon Breeder helped to get Feraligatr out faster, and the Baby Pokemon were used to put out damage and cycle cards while stalling out the opponent, since the ruling for Baby Pokemon was that the opponent had to flip a coin and couldn’t attack if they landed on Tails. Feraligatr was a pretty powerful deck back in its day, but a lot has changed since the Neo Genesis days. So naturally, if it were to get reprinted, it would need some adjustments. Luckily we don’t have to wonder what those adjustments would be; at the start of May, the Pokemon Company released a special sub-set called Champion’s Road, which released updated versions of older cards from as far back as Neo Genesis – one of which includes an updated Feraligatr. So would this Feraligatr see play in today’s game? The new Feraligatr has 160 HP, and his Riptide attack is a 2-for-10 that adds on 20 damage for each Water Energy shuffled back into the deck, meaning he’s much more powerful to compensate for the higher HP scores of the modern game. However, he’s also lost a lot of the tools that made Riptide so powerful in the first place. Cards like Professor Oak are now limited to once per turn Supporters, and search cards and evolutions are focused more on cards like Rare Candy and Ultra Ball, which opens the deck up to be vulnerable from Garbodor. There’s also no Trash Exchange card to recycle resources and potentially dump massive amounts of Energy into the discard pile to consistently deal out damage, meaning that it may be the case that Feraligatr doesn’t have all that he needs for Riptide to be a powerful deck in today’s game. Not to mention there aren’t too many Pokemon capable of stalling out opponents in the same way the Baby Pokemon could. It’s certainly a welcome upgrade to the card, but Feraligatr is much tamer now than he was back in his heyday. A modern Riptide deck wouldn’t likely be able to compete on the same level as some of the modern decks can, but it’s not a deck that I’d count out of the running either. A lot has changed with the game, and it might be that the right combination of cards to make Riptide a real threat again are just around the corner. Either way, Feraligatr is a fun card to experiment and play around with, and it’s an important part of Pokemon TCG history. While the old deck can’t come back to being as overtly powerful as it once was, the revitalized deck might just be able to do the same thing in a more balanced way. Arora Notealus: Feraligatr is one of, if not my most favorite Pokemon in the entirety of Pokemon, and to have him be recognizable as such a powerful card at one point in time just brings me a lot of delight. I mean he’s a freaking alligator that stands on two legs! He oughta be memorable for something amazing! Side Review: Abomasnow – interestingly, Abomasnow can provide an alternative means of powering up Feraligatr in the absence of an Aqua Patch on-hand. He’s a bit slower than Aqua Patch, requiring to be put into play from the hand evolving a Snover in order to get that Energy, but the slow pacing could match up with Feraligatr’s own slow nature. I mean, you wouldn’t want to Aqua Patch a Totodile for instance if you weren’t gonna evolve it into Feraligatr! Needless to say, Abomasnow might have potential in this deck. Next Time: Going through the motions of another set of forms! Feraligatr (NG 005) will receive a reprint in the upcoming Champion Road expansion set in August. This Stage 2 160 HP Water Pokemon has an ability that synergizes with its attack. The ability, Downpour, allows you to discard an energy once per turn. That discard helps fuel its attack, Riptide, which does only ten base damage but then does twenty more damage for each Water energy in your discard pile. Unfortunately, then you have to recycle all of your energy back into your deck … which means good luck top decking a draw support card. All those energies are going to muck up your deck. Sure, we have Sycamore (oops uh wait not after August we don’t!) and Ultra Ball and Sophocles and Crasher Wake and other resources to help put things into the discard pile, but overall I just don’t think you’ll be able to get ten Water energy cards into your discard pile on a repeatable basis. Even if you use Counter Energy to meet the attack’s two Water attachment cost, I still don’t think you’ll be able to get a whole lot of energy in the discard turn after turn after turn. And it’s a Stage 2 so it’s inherently at a significant disadvantage. Sorry, but I just don’t see this being competitive in the meta after August or September. If you didn’t have to return all of you Water energy cards back to your deck, this would probably have a lot more of an upside, but the way this is translated right now, it’s more like Forgetitatr than Feraligatr. Once again, we’re looking to the past to inform us of the future as Feraligatr (Neo Genesis 5/111) is getting an update that is already out in Japan, and which we’ll most likely receive in our next expansion. So, what did the original do and how did it perform? This is a Stage 2 [W] Pokémon from a time when many Stage 1 Pokémon and nearly all Basics had seemingly been nerfed in light of the raw power displayed by the best of the Gen I-themed sets (Base Set, Jungle, Fossil, Base Set 2, Team Rocket, Gym Heroes, and Gym Challenge). This was to give more Stage 2 Pokémon a chance to shine. This card also released not too long before the first set rotation, and the adoption of what we now call “Standard”, and which was also technically “Standard” as soon as it was adopted back then, but that most would call “Modified” until a few years ago. Being a [W] Type mattered because – if I am remembering the metagame correctly – at least one popular and potent deck prior to its release was built around Blaine’s Arcanine, but we’re going back to the point where I was just learning that what I thought was good often differed greatly from what won tournaments. Feraligatr has 120 HP, the maximum for any Pokémon when it was printed and until the introduction of Pokémon-ex about three and a half years later with the Gen III sets. Its [G] Weakness wasn’t good, but neither was it terrible; there weren’t a lot of great [G] decks at the time and the ones that were good may have been specifically because they were exploiting [G] Weakness on one of best decks in the metagame. A lack of Resistance was typical back then, just as it is now, and even was still a missed opportunity and not a true defect. However, please note that at this time, not only were damage output and HP scores lower (which might cancel out) but Resistance provided -30 damage; there were times when Resistance and a strong enough offense (or disruption) would allow you to wall in a manner that currently requires a protective effect! The card’s Retreat Cost of [CCC] was an issue, making it relatively easy to strand in the Active position. Feraligatr was famous at a time when Switch wasn’t legal. Let that sink in; it isn’t just that we lacked powerful modern plays like Float Stone, but we didn’t even have a simple Switch. Escape Rope by another name? Yes, it was called Warp Point. A weird variation on Guzma? Yes, it was an Item called “Double Gust”; each player got to force the opponent’s Benched Pokémon of his or her choice into the Active position (your opponent picked first). Pokémon Powers are the original “non-attack effect” of the Pokémon TCG, a direct precursor to Poké-Bodies and Poké-Powers, which are themselves the direct precursor to Abilities. In fact, Poké-Bodies and Poké-Powers, UNLIKE Abilities, have a direct relationship to Pokémon Powers; literally, Poké-Bodies + Poké-Powers = Pokémon Powers, so an effect which worked on Pokémon Powers would apply to all three of them, as would an effect that stated it worked on “Poké-Bodies and Poké-Powers” (or some similar wording). The division was made because Poké-Bodies were passive while Poké-Powers were actively used, and to tone down effects as most would only work on one or the other (and not apply to older cards with Pokémon Powers). All Pokémon Powers and most Poké-Powers will have a line of text stating they stop working if the Pokémon in question is afflicted by a Special Condition. Technically, the older ones state that only Confusion, Paralysis, and Sleep shut them off, but that is because the term “Special Condition” is a later invention (and Poison was added to the list before that). Feraligatr sports “Downpour” and it allows you to… throw away your [W] Energy from your hand. Technically, you do it one card at a time, but you may do it as many times as you wish (before you attack) in a turn. Why would you do this? Besides thinning your hand (and indirectly your deck), the answer is “Riptide”. That is the name of Feraligatr’s lone attack, and it has a chunky [WWW] cost that would have taken the full three turns to build back then (I don’t remember any attachment shortcuts). It did 10 damage plus another 10 per [W] Energy in your discard pile, THEN shuffled all that Energy back into your deck. Before protective effects, that means 11 Energy in the discard pile KO’d anything. Most Basic Pokémon (and even many Stage 1 Pokémon) didn’t even need that much, as their HP scores rarely exceeded 70 or 90. If you can reliably, repeatedly dump enough Energy for OHKO’s, that sounds great… but could you do that back in the day? Yes. I don’t know what Feraligatr was like in the Unlimited Format of the day, but in the first two Standard Formats, it was a beast. Regrettably, I don’t have any of the old tournament results handy, but I was used to seeing things like a Top 8 where five to seven decks were Feraligatr, one or two were Crobat (Neo Revelation 4/64), and maybe one variable competitive deck. Crobat, which arrived nine months after the release of Feraligatr, was a [G] Type as the video game Poison-Type was still being lumped into the TCG Grass-Type at this time (the shift to [P] would happen later). When I mention “maybe one variable competitive deck”, I’m not talking about a specific deck or its variants, but anything else that was considered “good” at the time was clawing for a place at the table. No, not the entire Standard run of Feraligatr; its grip grew looser and looser with every set released. I’ll also remind you that it is much more difficult to get a feel for the old metagame, not only because information has been lost to time but also because WotC didn’t implement a robust tournament structure for Pokémon. Which may also have contributed to the focus on Feraligatr; when you’re seeing the results of just two or three major tournaments over the course of a year, you go with what you know. Okay, okay… so Feraligatr was great, how did it actually work as a deck? again, we won’t worry about it before the original “Modified” Format. That means we’re looking at the 2001-2002 Standard Format a.k.a. “Rocket-On” Modified Format, as well as the 2002-2003 Standard Format a.k.a. “Neon” Modified Format. Rocket-On would ultimately range from the Team Rocket expansion through the Legendary Collection, though that lack of tournaments I mentioned means that in a lot of places, the Legendary Collection released after any significant tournaments were being held, even though it was two months before set rotation. Neon consists of Neo Genesis through Skyridge by its end; EX – Ruby & Sapphire had already released before the Neon Modified Format ended, but WotC was none too keen on allowing Nintendo-made TCG cards into events. During its Rocket-On days, Feraligatr enjoyed a slow format, where it did not necessarily need to Riptide every turn; most competitive decks needed at least two turns to ready a worthwhile attacker and rarely could prep more than one at a time. Though, at the time, Feraligatr decks seemed fast. They would probably use their initial Energy attachment on something like Cleffa (Neo Genesis 20/111); its “Eeeeeeek” attack allowed you to shuffle your hand and draw seven cards, while the “Baby Rule” (text printed on the card) forced your opponent to flip a coin if he or she attacked while Cleffa was Active. If “heads”, the attack would go through as normal, but if “tails”, the attack failed completely (no damage, no effects) AND your turn ended. Unless a player got lucky with coin flips or uses of Double Gust, a Cleffa or two would buy enough time to manually build that first Feraligatr. All attacks had to flip, so if two Cleffa were facing off, setting up could be delayed even more! Other options were the Trainers Misty’s Wrath and Professor Elm. These may be character-based cards, but they released before the Supporter mechanic was implemented, so they were played like Item cards, and even count as Item cards if used in the modern Unlimited Format. Misty’s Wrath allowed you to look at the top seven cards of your deck, select two of them to add to your hand and discard the rest. Professor Elm had you shuffle your hand into your deck and draw a new one of seven cards BUT prevented you from playing any more Trainer cards that turn. Professor Elm was used in most decks, with Misty’s Wrath reserved for those that could handle the reckless discarding… or turn it to the deck’s favor, such as with Feraligatr. With some luck, once setup you’d score OHKO after OHKO. Without that luck, you’d still be doing it every other turn or every third turn, which was sufficient at this time. Remember, your opponent took about three turns to set up each of their own heavies, sometimes four. Pokémon Breeder wasn’t reintroduced until the end of the Rocket-On Format, so very few Pokémon could skip their Stage 1 form. This means you didn’t need to swing for 120 every turn; if your opponent tried to build something on the Bench, odds were you could OHKO their meatshield(s), and if they tried to build something up while Active, it would struggle to do anything significant before being 2HKO’d or 3HKO’d. Also relevant was Trash Exchange, also an Item card. This was another card not uncommon to most decks, as it allowed you to count the cards in your discard pile, shuffle your discard pile into your deck, then discard from your deck until your discard pile contained the same amount of cards as before. This turned the drawback of Riptide into a serious advantage; with the tiniest bit of luck, useful cards you’d already used would return to the deck while some of your Water Energy cards would end up in the discard pile. By the end of the Rocket-On Format, all decks were happy to use Bill. Once again, he was treated as a “normal Trainer” card or Item; while he was re-released as a Supporter, that wouldn’t happen until several years later. Bill was common to Neon Format decks as well, though as the Neon Format became more and more fleshed out, Feraligatr began to see more and more successful competition plus it lost Misty’s Wrath and Trash Exchange. So, now let us take a moment to peek at what is to come; the updated Feraligatr. It remains a Stage 2 [W] with [G] Weakness, no Resistance, and a Retreat Cost of [CCC]. It is worth noting that Croconaw (Shining Legends 19/73) should be sticking around through rotation, so an opponent who fails to OHKO a Feraligatr may find a Croconaw using its “Plunge” Ability to force itself into the Active position AND gain all of Feraligatr’s attached Energy at the same time… after which it can just Evolve into another Feraligatr (Plunge is a once-per-turn Ability, NOT a coming-into-play Ability). Feraligatr has 160 HP, so it surviving an attack is pretty reasonable; OHKO decks will still OHKO, as will most serious [G] Type attackers, but the decks that currently rely on 2HKO’s? This could present a problem for them. This new Feraligatr has Downpour as an Ability; other than now having to worry about effects that apply to Abilities and not those which apply to Pokémon Powers, and shedding the clause about no longer working when Feraligatr has been afflicted with a Special Condition, it has the same effects as before. Riptide also returns, but now it only costs [WW] and does 10 plus 20 per [W] Energy in your discard pile (before shuffling all those [W] Energy back into your deck). It will likely be much, much harder to get a lot of Energy into your discard pile, so even doing +20 damage per, you’re going to want a minimum of five [W] Energy in your discard pile, with the largest targets taking about 10-12 (and that isn’t including things like a Wailord-EX with Fighting Fury Belt). I don’t think things are hopeless, however; there’s the trick with Croconaw to avoid giving up KO’s, which would make Riptide for a 2HKO a lot more reasonable. Zoroark-GX isn’t going anywhere, either, and it allows you another excuse to discard basic Water Energy cards from hand but will let you draw two cards for doing it. Throw in the right supporting Items and maybe even a few additional supporting Abilities, and a deck focused on 2HKO’s with the threat of being able to OHKO anything? I’m not expecting it to be BDIF, but if someone can make it all fit in the same deck and flow smoothly, it should be competitive. Limited: 2.5/5 – Even if you pulled the entire line, it might take several turns to rebuild your [W] Energy supply to use Riptide.